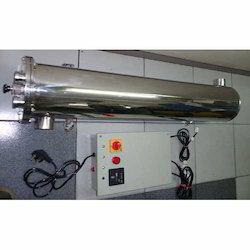 We offer a high-quality UV Water Treatment system to our valuable customers. This product is widely used for effectively disinfecting the water from various microorganisms. This system is highly Eco-friendly in nature as they do not use any chemicals for its operations. This product is highly appreciated as it retains the natural taste and odor of water. This product is available at cost effective market prices. 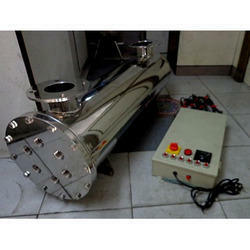 We are one of the leading manufacturers of wide range of high quality of UV Sterilizers. These products are widely used as a natural way of disinfecting the water from various microorganisms. These products are manufactured using latest technology and advance plant machinery, to ensure high standards quality. These products are offered with online UV monitoring system for intensity measurements. UV energy is found in the electromagnetic spectrum between visible light and X-ray and can be best described as invisible radiation. UV system consists of low-pressure mercury Discharge lamp which is made of special quartz glass envelope material and with filled with an inert gas, which delivers a constant high intercity light. We are offering UV System that is extensively used in different industrial sectors such as food and beverage, pharmaceutical, hotel, and so forth. These are highly cost effective due to low operating costs. These are appreciated because there is no change in taste and odor of water and the process is completely free from use of chemicals. These are manufactured using STAINLESS STEEL 316L MATERIAL. Looking for Ultraviolet Disinfection System ?